Answering your audience’s questions is a great opportunity for a presenter. It gives you the chance to reinforce the main points from your presentation and boost your expert status as a speaker. 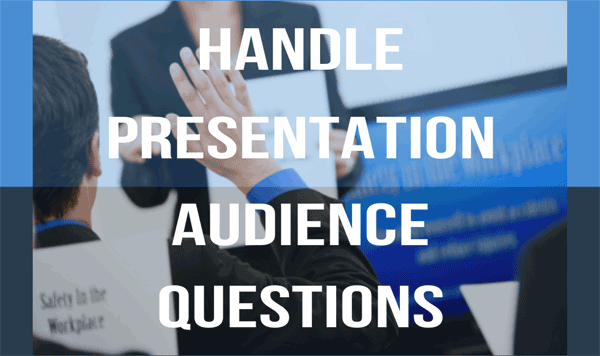 Therefore you need to know how to handle presentation audience questions. So you need to be ahead of the game. You should aim to be fully prepared before you face your presentation audience. And, of course, it doesn’t matter if it’s a PowerPoint presentation or any other. That preparation doesn’t need to be tough. Because as a presenter you are going to know most if not all of the subject areas that are generated from your presentation. Prepare questions. First of all you should aim to write down the top ten questions that might come up from your presentation. Second, think about the subject material, the points you intend to make and the supporting images or videos. Then consider the audience. Remember to think about what is topical or timely to them…their industry…their market sector or their competitors. Be open to the news of the day: political, business and economics news. Finally, write down the questions. With that done, you should consider their answers. Make sure that your answers are short and concise. Because your audience will appreciate short answers to their questions. Additionally your answers are not an excuse to show off exactly how much you know. That’s because they should support you. Your answers should reflect your presentation and reinforce your main points. Prepare some more questions. Now you can repeat this exercise with another ten questions. And another ten answers. With a total of 20 questions and their respective answers you have covered a good 98% of the likely questions that your audience will come up with. Be ready for ones that you can’t answer. So, try some responses along the lines of…”I don’t know that one. How about you and I look into that afterwards?” Become comfortable with this style, noting that you must follow up with the questioner after your presentation. Whatever you do of course, you don’t want to replicate the pause technique of Herman Cain. Rehearse. Your questions and answers should be rehearsed. Take care however that you don’t learn your answers. You want them rehearsed. But you also want them to sound lively, energetic and spontaneous. Take questions. If it’s feasible, try to take questions before you conclude your presentation. Concluding and wrapping up all the disparate strands of a presentation can be a lot easier once you’ve tackled audience questions. Your presentation will finish with a bang. Not a whimper. Your contribution will be more memorable. Giving your answers. Inviting questions can yield a nil return. It so happens because no-one in your audience wants to ask the first question. It’s not that they don’t have questions. Therefore, a good work-around is to speak to a colleague or the meeting organiser beforehand. So, get them to ask the first question…and prepare it for them! Once you’ve heard the question, replay it to your questioner. Check that you’ve heard it and understood the question correctly. If needed (and it might be in a large conference room), repeat the question so everyone can hear it. Then answer the question briefly and coherently. Take some care to give your answer to the questioner. It’s their question, they asked it and they should be answered by you. Establish eye contact with them, making sure of course that you can be heard by everyone. Of course, you want to keep your answers short. Just look at this short speech from Rahul Gandhi. Because his answers to questions took forever. There are 5 key pointers to help you as you get yourself ready to take questions in your presentation. Rehearse your questions and answers. Take questions from your audience. Give your answers and hit a key point every time. Follow these five steps to get the most from your question and answer sessions during your next presentation. For more advice on how to handle presentation audience questions, you can always attend a public presentation training course.